I’ve finally come back to Ripsaw, in a round-about way. I’ve started working on the client application again as a way to investigate the Windows Ribbon Framework. 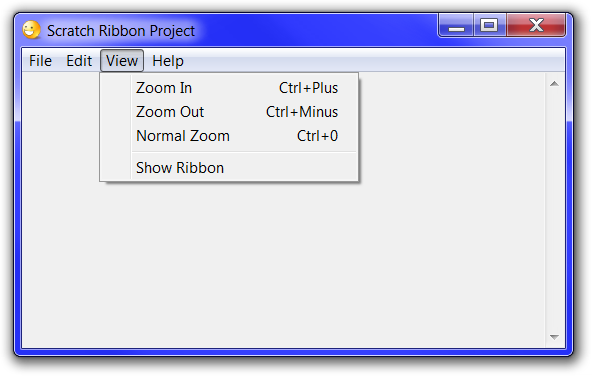 Originally, I had planned to create a Ribbon implementation for Windows 7 and later, and a menu-based implementation for earlier Windows versions, or for users that preferred a menu over the Ribbon. After I played around with the API a while, I realized it would be fairly simple to support both the Ribbon and the traditional menu in one executable. In this article I’ll describe a sample app that I put together that shows how to accomplish support for both command-selection methods. The Ribbon was first introduced with Microsoft Office 2007 as a way to tame the huge menu and toolbar hierarchy that had evolved to present all of the suite’s features to its users. It then made its way into Windows 7 in the Paint and Wordpad applets, and can now be found in several third-party applications. As with most things Microsoft does, it seems that users either love or hate the Ribbon. I happen to love it, since I’ve always disliked toolbars and I find menus clumsy, at best. Since everyone doesn’t share this opinion, and it’s relatively cheap to include a menu, and since I want to support XP, Vista, and Windows 7 with a single executable, I’ll try to satisfy as many people as I can by allowing users to select the command presentation method they prefer. The application we’ll be working with began its life as an adaptation of a scratch program that Raymond Chen uses as a framework for example programs in his articles. I adapted it to my own very thin C++ wrapper and added some things that I like to have in fully featured applications, then set about making it work with the Ribbon. You may download the Visual C++ 2010 Express project and follow along below. There is no license. This code is public-domain code, and may be used in any manner without restrictions. I offer no guarantees or warranties at all. First of all, you’ll need Visual C++ 2010 Express (which is free) or one of its more sophisticated versions (which are not free) in order to compile the project. If you prefer to use a different compiler you’ll have to adapt the code and project as necessary. You’ll also need the Windows 7 SDK version 7.1. Finally, in order to see the Ribbon interface you’ll need to run the application on Windows 7 or on Windows Vista SP2 or later with the Platform Update installed. When the application runs on Vista SP1 or earlier it will only display the traditional menu. "$(WindowsSdkToolsDir)\bin\uicc" "%(Identity)" "%(Filename).bin" /header:"%(Filename).h" /res:"%(Filename).rc2"
As I mentioned earlier, this project began as a scratch application. The idea was to have a starting point for new applications that would provide a lot of the boring, boilerplate stuff so that I could concentrate on the interesting bits of new applications. Figuring out how to integrate the Ribbon and make it work was not entirely straightforward, which I found disappointing. The answers to my questions were usually somewhere out on the Internet, but never in one place. That’s why I decided to write this article to help those of you who might be having the same struggles I had. After you’ve downloaded the Visual C++ 2010 Express project, open it in Express, build it, and run it. Or, if you prefer, just download the executable and run it. On Windows 7, and on Windows Vista SP2 or later with the Platform Update installed, you’ll see a window with a Ribbon control across the top. 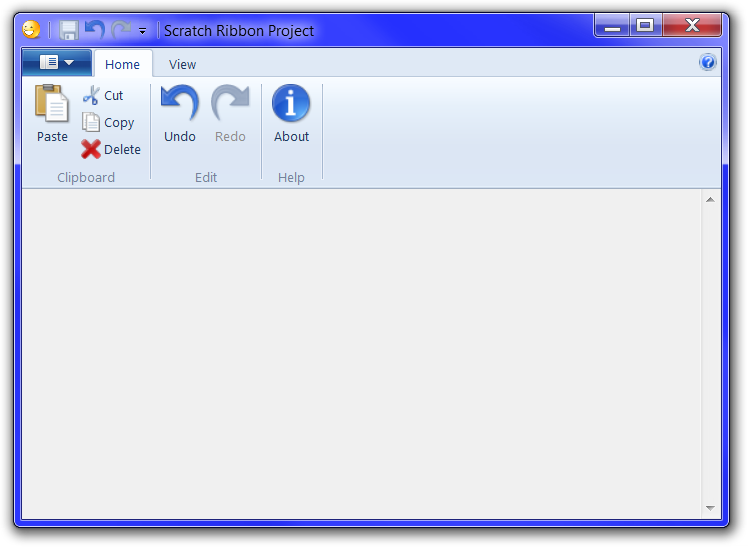 In the View tab of the Ribbon is a button that will allow the user to switch to a traditional menu bar. 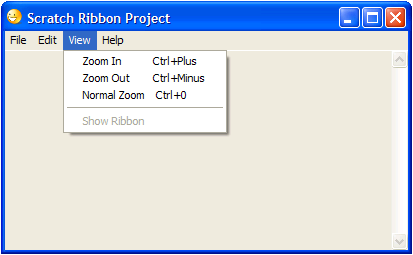 The View menu has a corresponding option to allow the user to display the Ribbon again. Most of the other commands will simply output a line of text in the client area describing the option that was selected. On Windows XP, and on Windows Vista without the Platform Update, you’ll instead see a window with a traditional menu. The “Show Ribbon” menu option is disabled because the application detects that the Ribbon API is not supported on those platforms. I won’t go into too much detail about the usual Windows API elements of the code, or about the minimalist C++ framework it uses. I also won’t get into the details of the Ribbon markup, which is covered in detail in the MSDN Ribbon documentation. Instead, I’ll cover the bits of the code related to supporting the Ribbon and the menu. The comment about goto is a subject of another article entirely, so we’ll ignore that for now. It’s necessary to initialize COM because the Ribbon API is a set of COM objects that implement the various Ribbon interfaces (IUIFramework, IUIRibbon, etc.). A little further down in the initialization method the code reads the saved user settings, if they exist, then checks to see if the application should be using the Ribbon. The setting will be true by default, no matter what OS the application is running on, so the application will call the CreateRibbon method. The CreateRibbon method uses the Ribbon API’s COM objects to initialize and show the Ribbon. If the COM objects are created and their methods are called successfully, the API will remove the main window’s menu and display a Ribbon in its place. This method will fail on platforms that do not implement the Ribbon API, and since the application displays a menu on its main window by default, that menu will remain in place. First of all, in the App class declaration in ScratchRibbonProject.h, the relevant methods are declared. The definitions are in ScratchRibbonProject.cpp, and we will examine each of them in turn. The method is called with the UI_VIEWVERB_CREATE and UI_VIEWVERB_DESTROY verb constants at Ribbon initialization and tear-down, respectively. This implementation uses those calls to load the ribbon settings when the Ribbon view is created and save them when it is destroyed. We’ll look at the LoadRibbonSettings and SaveRibbonSettings methods a little later on. The UI_VIEWVERB_SIZE indicates that the Ribbon’s size has changed (for example, the ribbon has been minimized). The application may need to respond to this notification to adjust any other windows that need to be moved or resized based on the new Ribbon size. 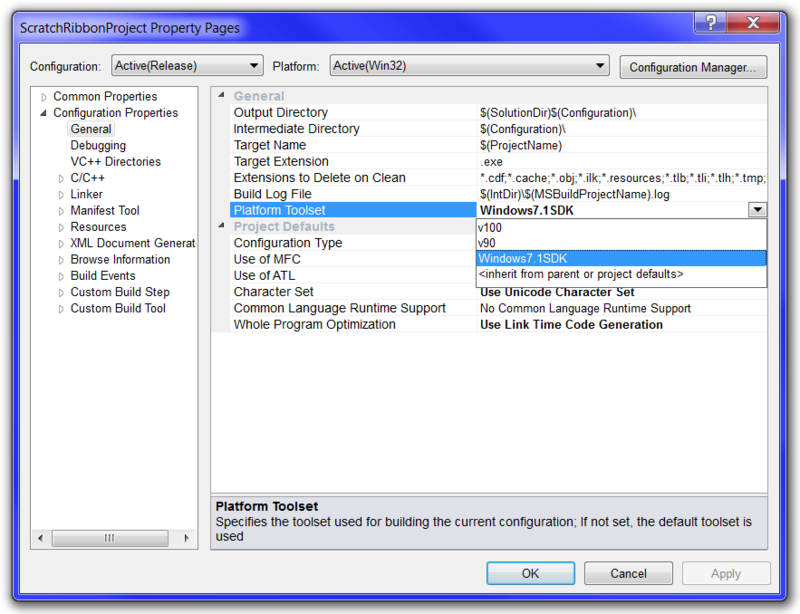 In this example, the method adjusts the client area by calling the OnSize message handler. The OnDestroyUICommand method is called each time a command is destroyed. This would give the application an opportunity to clean up its command handlers, if necessary, but in our case there’s nothing to do. Finally, we need to implement the two methods of the IUICommandHandler interface, which will be shared by all of the Ribbon commands in our application. 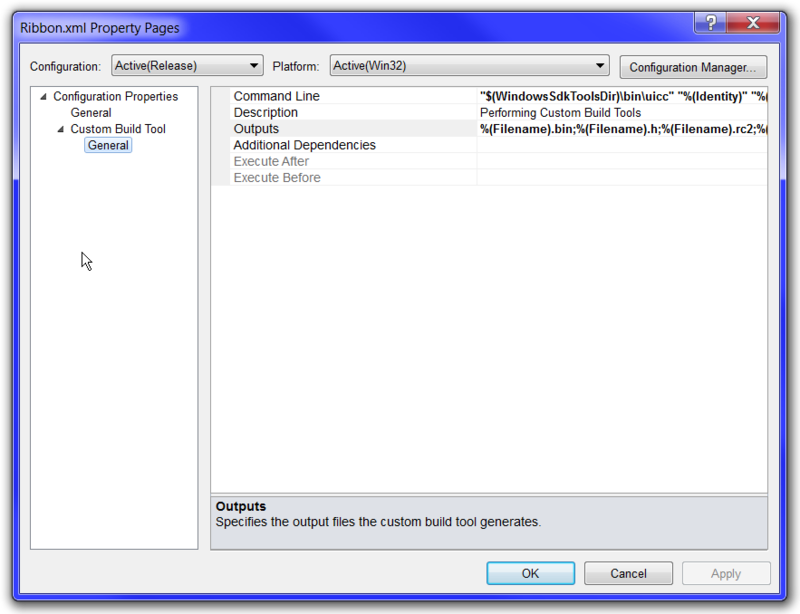 The UpdateProperty method is called by the framework to request an update to a command’s state. 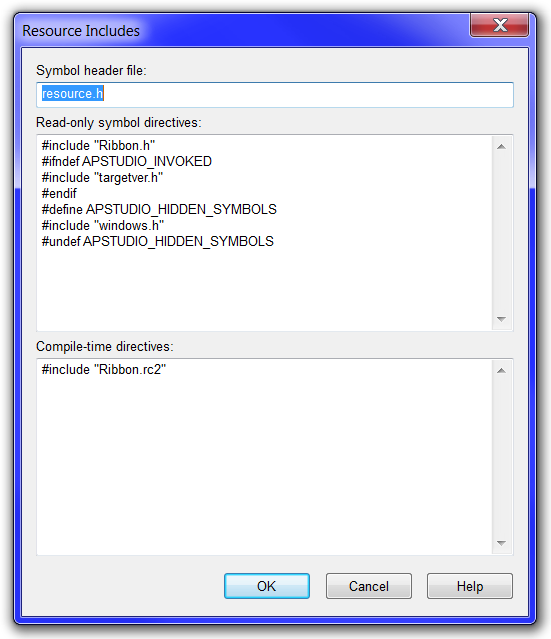 As an example of how to modify the enabled/disabled state, this application changes the state of the Save and Redo commands based on flags maintained by the App object. At last, we come to the method that connects activation of the Ribbon commands to actual application code. The Execute is called with an execution verb constant of UI_EXECUTIONVERB_EXECUTE when the application needs to respond to a command event. This application posts a WM_COMMAND message equivalent to what would have been sent if the command had been selected from a menu. This, in turn, triggers the WM_COMMAND handler in the WndProc method. Earlier, we modified ScratchRibbonProject.rc to include Ribbon.h so that the constants defined in that header by the Ribbon compiler could also used by the menu resource. This code sets a flag (killRibbon) to activate special message handling in order to work around some painting problems (which we’ll examine later). It then calls the CloseRibbon method. I ran into a number of painting problems in this code, and I eventually decided to just hide the window, restore the Ribbon, then show the window again. This is a little bit jarring, but until I can find a workaround for the painting problems it’s effective enough. (If you find a better workaround, please let me know.) I felt particularly dirty about posting a WM_SIZE message, but that was the only reliable way I could find to adjust the client area properly. When I saw that the same technique was used in WTL 8.0, I didn’t feel so bad anymore. Above, we saw that the OnViewChanged method calls LoadRibbonSettings when the Ribbon is initialized and SaveRibbonSettings when the ribbon is destroyed. The SaveRibbonSettings method creates an IStream object on a file in the user’s application data directory and passes that stream to the pRibbon->SaveSettingsToStream method. The Ribbon framework will write its settings into this stream, after which the SaveRibbonSettings method releases the IStream and IStorage objects. At Ribbon initialization the LoadRibbonSettings opens the Ribbon stream in the file created by SaveRibbonSettings and passes it to pRibbon->LoadSettingsFromStream. This will restore the previously saved state of the Ribbon. The state of the Save command is controlled by a dirty flag set in the App object. If the current “document” is flagged as dirty, and therefore a candidate for a save operation, the Save command should be enabled. To set or clear the dirty flag the application calls the SetDirty method of the App object. This method modifies both the menu and Ribbon commands. It first checks to see if the pFramework pointer is non-null. If it is, it points to an instance of the IUIFramework interface implemented by the Ribbon API. It uses the pointer to call the InvalidateUICommand method, specifying that the ID_CMD_SAVE command should be invalidated. This instructs the framework to call the application’s implementation of IUICommandHandler::UpdateProperty, which will set the state of the command based on the dirty flag. All that we have left to cover are the various clean-up actions to restore the client area and handle some painting problems. First of all, there is a read-only edit control in the main window’s client area to display the descriptions of the selected Ribbon or menu commands. This control needs to be resized to fit around the Ribbon control when the main window is resized or the Ribbon size changes. This is accomplished by handling the WM_SIZE message. The AdjustClientArea function accepts the client width and height and adjusts the edit window to find around the Ribbon. There are also handlers for WM_SIZING and WM_ACTIVATE that check the killRibbon flag and call SetWindowPos if it is set. If it is not, they defer handling to DefWindowProc. I only have a couple of annoyances with this code. First of all, I have to check the validity of each command message in OnCommand since the keyboard accelerators are not synchronized with the corresponding Ribbon commands as they would be with the menu. This is a minor complaint, though. The more annoying issue is that the ribbon graphics increase the size of the executable. For the users that prefer to use the menu this is a waste of memory, but I could get around that problem by keeping the Ribbon resources in a separate DLL. I haven’t tried implementing that yet, but I’ll post an update where when I do. I’ve covered a lot of ground here, so please leave a comment if anything is still unclear. ‹ GWA Band: NATIONAL CHAMPIONS!